“Today is the crown of our salvation and the manifestation of the mystery that is from all eternity.” Today the Holy Spirit descended upon mankind in the person of the Most Pure One, and the Power of the Most High, the Word of God, overshadowed her and took up His abode in her. The ladder joining heaven and earth was established; man received the power to become God by grace, for the God-Man is conceived today in the womb of Her who is full of grace. 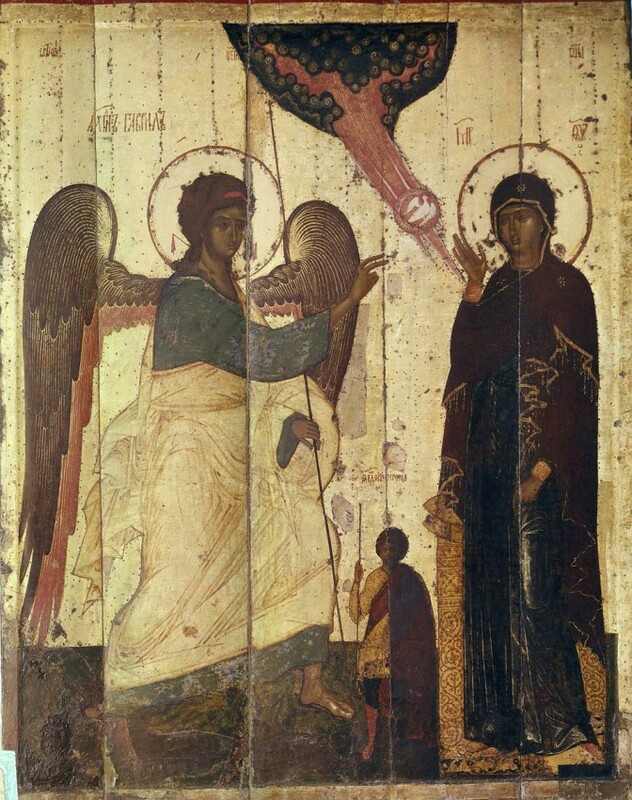 The annunciation, the crown of our salvation, is also the beginning of the Theophany, for in it the activity of the entire Holy Trinity begins to be revealed: the Father wills, the Son descends, and the Holy Spirit overshadows. This day is also the anticipation of Pentecost, for creation in the person of the Most Pure One has been vouchsafed to receive the Holy Spirit into itself, in a tangible action of the conception of God. That day also manifested in itself the power of God’s incarnation, for Mary became the Mother of God, our Lord Jesus Christ. Creation was destined for the Annunciation from the very beginning of the world; it waited and thirsted for it. Thousands of years passed before the human race reached the time of its blossoming, and she who had found grace with God appeared on the earth. The Annunciation was preordained within the depths of the Holy Trinity; nevertheless, the good tidings of salvation needed yet to be heard and accepted by man. The Lord inviolably honors the freedom of His creature, and therefore the Annunciation was directed toward that freedom. When the Archangel addressed his words to her, the time had come to decide the fate of humanity, the fate of the entire creation. In ancient times, the fate of the human race was catastrophically decided through Adam and Eve in paradise. Now a new Eve, Mary, is given the choice of either accepting or rejecting the Incarnation of God. The Annunciation is the ultimate and final manifestation of God’s love for the world, of God’s condescension. But in it is also manifested God’s ultimate and final respect for His creation’s freedom. The Incarnation of God could only manifest to a free and loving recipient of God. In the Most Pure Mary, full of grace, is concentrated all the power and all the will of man for receiving God. But this acceptance is the free and loving acceptance of the Cross, for the world was created by the Cross of divine love. It is also saved by the Cross—the Son is sent to the world to “take away the sins of the world”, in order to suffer out that sin, even unto death on the cross. And this Pre-eternal Counsel is fulfilled through the Cross’s power of Divine Love. That which manifests the power of the Cross in the heavens is on earth, in the sons of man, the joy of the Annunciation; for there never was nor can there ever be joy without the cross. Through the Cross of God’s love, piercing the virginal heart of creation, the most pure heart of the Ever Virgin Mother, the joy of the Annunciation now comes to the whole world. However, this joy is not a worldly joy, which seeks pleasure and flees sorrows, for its path is that of the Cross. What the Archangel asked the Virgin related to her accepting the Cross of being the Mother of God, of which she was cognizant to the depths of her heart through her prophetic chastity. She recognized the whole power of what she was being asked, and answered, Behold the handmaid of the Lord (Lk. 1:38)—how much meekness, how much courage, how much dedicated love there is in these meek words. The Annunciation was the tidings of Her Son’s cross and of the Mother of God’s standing by it. And at this immeasurable sorrow of the Cross, “through which joy shall come to all the world”, she, the Most Pure One, gave her consent to God: Behold the handmaid of the Lord; be it unto me according to thy word. But by her, through her most pure lips, all creation uttered these words of the Cross; rejoicing in her are the whole assembly of angels and the race of man, together with all of created nature, responsively embracing and concealing within its hearing the mystery of the Annunciation of the Cross. “A bird will not feather its nest on this day,” witnesses an Orthodox Russian folk saying. With the Most Pure Mother of God every human soul spoke and speaks now, opening itself up to receive the power of the Cross of God’s love, to receive the Holy Spirit and discover Christ Who is to be born. Mary gave her whole self to God till the end, she became the “Joy of Joys” for all who are born of earth, and showed us the way to acquire the incorruptible, immutable, eternal joy, saying, Behold the handmaid of the Lord; be it unto me according to thy word. Only through her submissive, obediently loving acceptance of God’s will for the Cross can true Joy come into each of our lives—for the Cross is the eternal witness of God’s love for the world, as well as of our love for God and man. The Cross is the power of love; this love is truly those glad tidings, the authentic joy, which is victorious and triumphant unto the ages. But these days, alas, a great dark cloud of despair hangs over the earth, onerous trials are tearing our times apart, and the heavenly azure of the Annunciation is concealed in our despondent and cruel hearts by a dark covering. According to the words of Revelations, And the dragon stood before the woman which was ready to be delivered, for to devour her child as soon as it was born (Rev. 12:4). Nevertheless, in answer to the dragon’s impotent rage we hear today the song of the Handmaid of the Lord: For he hath regarded the low estate of his handmaiden: for, behold, from henceforth all generations shall call me blessed. He hath put down the mighty from their seats, and exalted them of low degree. He hath filled the hungry with good things; and the rich he hath sent empty away (Lk. 1:48, 52–53), for the Lord is nigh unto them that are of a contrite heart and He shall save the humble of spirit. Declare the glad tidings, O earth, of this mystery—the glory of the Theotokos, of Golgotha! O Virgin Mother, thou deepest well of living water in the desert of this world, give us who thirst also to drink from thy virginal hands, with the streams of the true wisdom of God, that through this we might be able to serve Christ Who suffers in this world, to serve the Lamb of God in spirit and in truth. As the beautiful red of paradisal fragrance conquers all sinful death, reveal also in us this day the mystery of Thy Annunciation of the Cross, the mystery of obedience even unto death, accepted voluntarily. Reveal the mystery of Thy sacrificial love to the end, unto which all meek creation hearkens, now rejoicing in Thee, and with mystical hymns calling Thee blessed; to which all who are humble and contrite of heart hearken. To thee do I call out in tears and with Gabriel Iam amazed at the exceeding radiant beauty of Thy virginity, and the fiery heights of Thy love, and the fathomless depths of Thy sorrow. We call out to Thee, O Most Pure One: “Rejoice O Thou who art full of grace, create also in us a maternal heart that cares for all the children of the world, and grant us Thy perfect joy—the joy of the Holy Spirit, now overshadowing Thee, and teach us to magnify Thee in Orthodox manner, and from day to day, night to night, to declare the glory of the Cross in Thee. May the sorrowing children of the earth be comforted in Thee as they sing: ‘Rejoice O Thou who hast received joy, the Lord is with Thee—He Who hast great and incomprehensible mercy.’” Amen.